As part of the ongoing efforts to document the selection process for breeding stock to improve productivity, ALBC was awarded a grant from the Seimens Foundation to pursue this area of study with waterfowl and turkeys. 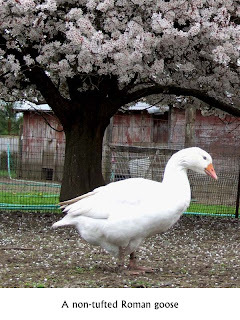 In April 2009, the first step in this project began with a visit to the Holderread Waterfowl Farm and Conservation Center in Oregon to learn about the breeding practices that the noted master breeder, David Holderread, uses for his geese and ducks. I have to admit it couldn’t have been a more pleasant time of year to visit the northwest as the tulips were in bloom, the seafood was fresh, and spring was definitely in the air! I was greeted by both David and his wife Millie and jumped directly into learning about production as David took me into the incubator room while he candled and turned hundreds of goose and duck eggs. Using tried and true cabinet incubators built in the 1930’s, David pulls the first of many trays that will need to be hand-turned and candled for their once a week check. While candling he checks for the tell tale “custard ring” around the air cell and lack of blood vessels within the egg that serve as indicators that the eggs have gone bad. Eggs are incubated at the lowest possible temperature since to err on the low side (~99.25°F) is better than the effect high temperatures would have on eggs. As the breeding season progresses for the females, their eggs become more thin-shelled as their body’s resources are used. The temperature in the incubator may then be adjusted by 1 – 2 tenths of a degree to compensate for the change. David has found that appropriate humidity within the incubator can be variable with the location of a farm but typically runs between 55-65%. Towards the hatch date this will increase up to 75%. Wet bulb thermometers are preferred on the Holderread farm for monitoring incubation. New thermometers are carefully compared for accuracy with at least two older reliable thermometers before a new one is accepted for use. The eggs are hand-turned 180° once a day and also 90° while in the incubator via exterior cranks every two hours. Although it’s labor intensive, David has found if he does not hand-turn eggs once a day outside of the incubator he will have a 30% reduction in hatchability. He believes that the slight cooling the eggs experience as they are turned outside of the incubator helps to strengthen the vascular system and will produce slightly larger air cells within the eggs that are associated with strong, vigorous ducklings and goslings. All of the eggs are lightly misted with water once a day as a supplement to the already humid incubators. If he does not mist with water once a day, David has documented that he will have a 20% reduction in hatchability. All of his eggs are cleaned within several hours after the eggs have been laid. They are then stored at 55 – 60° for up to 1 week prior to being slowly warmed up and then set in the incubator. All of the eggs are moved to a hatcher unit one week prior to the expected hatch date. Hatching times can fluctuate for geese from 28.5 – 31 days and for ducks 26-29 days total. After the birds hatch, they are physically evaluated at the age of 8 to 10 weeks. This is often the only time the birds will be physically handled in their life. As adults, they are only visually evaluated to minimize stress caused from handling. Dave added that unlike chickens, waterfowl are not tolerant of handling and you can blow an entire breeding season by doing so. D avid owes the great success of their waterfowl program to highly detailed record keeping. Without it there is no way to track or target problems that can easily found through trends in the data. 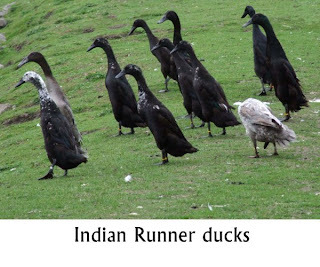 Following the incubation room, I was given a tour of the farm and viewed many breeds I have never seen outside of photographs such as the West of England goose, the Shetland goose, and a wide array of colors I had not before seen in Indian Runner ducks. Notably, they had some of the finest and largest Silver Appleyard ducks I’ve ever seen! As the tour brought us back to the farm house, David and I began talking of what he looks for in a good breeding bird. One of the key points that Dave felt was often overlooked is good leg structure. They should have strong legs to support grazing on pasture for long periods of time. He cautioned that even with strong legs, you should never pick up ducks or geese by them. You should also not run a goose or duck down in the process of catching them as this could also result in injury. A good indicator of bad legs is often poor body carriage. A horizontal carriage often means poor leg structure. The Holderreads breed for uniformity and balance in their birds. 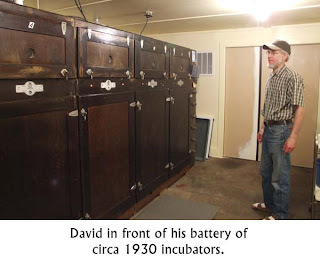 David believes the ideal body starts with a basically rectangular structure with rounded corners that re flects a wide heart girth and width of back that follows to the back end of the bird. 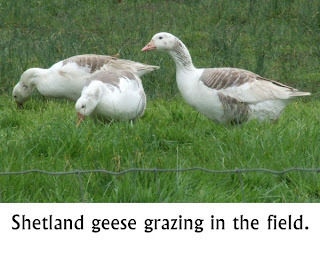 A well-bred goose can also be expected to be at their best production between two to five years of age. From five to eight years of age, production will fall off some but is still good. After eight years of age, production will decrease but the birds are still capable of breeding into their teens and even twenties in some cases. Ducks are at their best production levels at one to three years of age and begin to decline after approximately 5 years of age. I can attest first hand that David and Millie have their hands full with round the clock work during the breeding season. Some time after this year’s season, David plans to keep busy writing a revised edition of his wonderful book The Book of Geese: A Complete Guide to Raising the Home Flock which was last published in 1981. Keep your eyes peeled for the new book sometime perhaps next year! 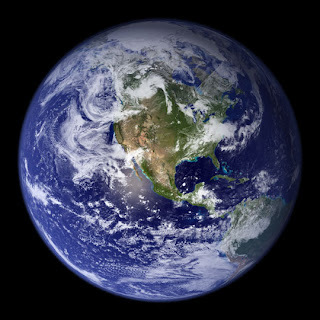 As I was walking on the treadmill at the gym last night, and watching American Idol (yes, I admit), I saw many commercials come on the television regarding Earth Day. There were ads for "green" cars, biodegradable potato chip bags, and more. The commercials kept coming, and they made me ask myself an important question: what am I planning to do to honor the Earth this Earth Day? This morning, 7:00am, the alarm went off. As I saw the sun peering through the curtains, I thought to myself - "Goodmorning Earth and Happy Earth Day." 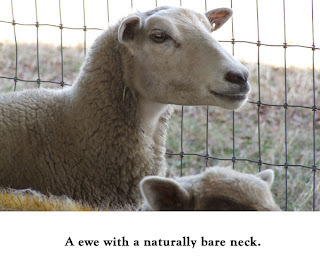 I still hadn't come up with anything spectacular to do to honor the Earth today, but then it dawned on me in the shower that at the American Livestock Breeds Conservancy, every day is spent honoring the Earth and particulary the rare breeds of livestock and poultry. Every day my co-workers tackle projects that help keep breeds alive. Each day our members work hand-in-hand with rare breeds to ensure that our children and our children's children will have the opportunity to enjoy these animals. Each day our partners in conservation and sustainability work hard to ensure that other parts of our Earth are conserved and cherished. So, on this Earth Day, I'm not doing anything too special. I'm sitting at my desk writing this blog post and its fulfilling and rewarding to know that the work that I am a part of is a critical part in the conservation of this Earth. Thanks to all the ALBC members, supporters, breeders, and partners that make our work possible. Part II – Of Florida Crackers…. I headed out of Mississippi early in the morning and made my way through Alabama after being stuck for nearly two hours on the bridge smack dab in the middle of Chacaloochee Bay, not far from the famous Bayou La Batre of Forrest Gump fame. Despite the delay, it wasn’t too bad a way to spend a pleasantly warm morning watching shrimp boats go by. I finally got to the panhandle b y mid-afternoon and met with Jack Summers of Bristol, Florida, about Cracker cattle. 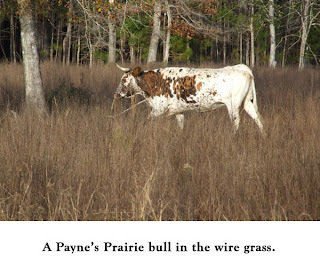 Mr. Summers has a herd of predominantly Ezell line Cracker cattle and some recently acquired Payne’s Prairie cattle to help increase the genetic diversity of the herd. 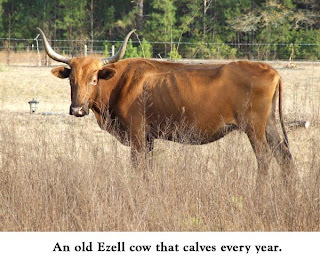 According to Jake, the Ezell cattle are mainly red or black in color with very few being spotted. He continued saying that they were used for both beef and dairy production and were selected equally for both. Jake manages his herd on approximately 1000+ acres of state land that he leases. The land is wire grass flat woods that are burned yearly. The cattle are offered hot mix containing cottonseed meal, salt, and minerals much like what the Pineywoods cattle often receive in Mississippi. The cattle are allowed to freely breed and typically follow a cycle of having a calf every other year with a few exceptional cows in the herd that have a calf every year with minimal input from the producer. 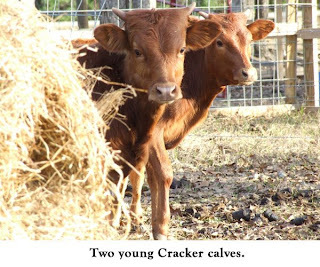 (Every calf from these amazing cows is kept within the herd and never sold.) Jake told me he has no problem whatsoever selling stock and he continues to have good prices on his cattle. He only sells bull calves at this point in time and has a long waiting list for people wanting heifers and cows. After seeing Jake’s Cracker mare he uses to hunt and move cattle, I made my way towards central Florida to spend the night and see Cracker sheep the following morning. Bright and early I headed out to Ocala to meet with Cracker sheep breeders Carol Postley and Ralph Wright. Both have been leading the way with documenting the breed and rescuing lines in danger of dispersal. 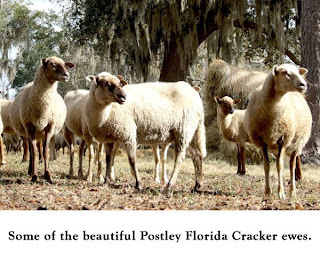 Through their work they estimate there are 500-750 Cracker sheep left in the state. 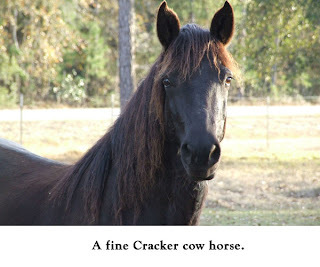 They have identified approximately 9 lines within the breed thus far. Carol herself currently has animals from a good number of the lines including Cox, Wing, Wilson, Aldridge, and Kern. 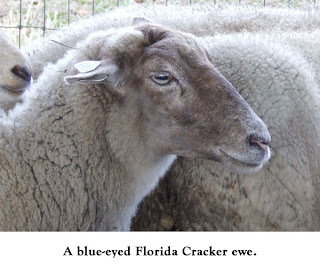 Carol and Ralph have observed that 90% of the Florida Cracker sheep have faces and legs that are multicolored with only 10% being solid white or solid black. Their population is largely polled and a good number of animals within several lines have bare necks, bellies, and tail heads making them very easy to shear. Typical adult weights are 150-170 lbs for rams and 100-125 lbs for ewes. Both sexes take a good two years to reach full adult weight. Cracker lambs are very vigorous and are almost immediately up and about with their mothers and never leave their side. Carol observed that the lambs are extremely quiet and she never hears them calling for their mothers because they are always within close sight of them. 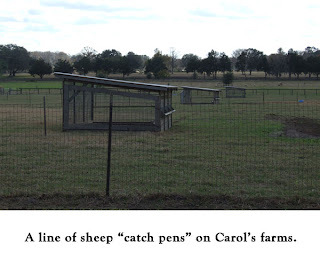 While at the farm I got to see these really great mobile catch pens that Carol uses to gather up sheep for testing, etc. She can bait them without going inside the actual cage and while the animals are busy eating, it’s easy for her to close the door behind them. They are very effective, especially for the sheep that were fairly feral and skittish. The floor of the pens is constructed of a sturdy metal mesh so that in wet conditions the animals are kept dry and don’t get muddy while in the pens. The mesh is fine enough so feet don’t get caught in it. The trip ended on a good note with loads of data not to mention over a thousand photos. It was well worth the time in gaining closer insight into what is happening with little known strains of critically rare breeds of the deep south. It is a critical time for many of these breeds and the future is not certain but with care, the outlook may be bright in the days to come.